The 200+ Men Foundation was established in 2004 as a public charity. The Foundation supports organizations and efforts in Hampton Roads that improve the lives of African-Americans with specific emphasis on encouraging and enabling males to reach their highest potential. Through generous donations from individuals, corporations and philanthropic organizations, the 200+ Men Foundation has supported scholarships for college bound students, summer camps for middle school boys, educational forums and symposiums, and financial assistance to charitable groups and individuals. 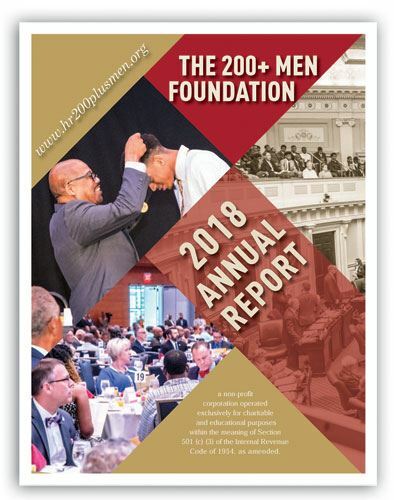 The 200+ Men Foundation is a non-profit corporation operated exclusively for charitable and educational purposes within the meaning of Section 501 (c) (3) of the Internal Revenue Code of 1954, as amended. The generous donations received in 2018 enabled the 200+ Men Foundation to help make a big difference in the lives of youth in Hampton Roads. Your support can help make a difference in 2019.